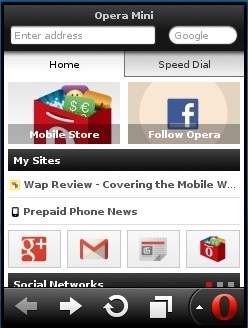 Opera Software has just announced the availability of version 7.0 of the Opera Mini browser for Java ME, BlackBerry and Symbian S60 second edition and latter including all Nokia Belle devices. Opera sent me a pre-release copy of the Java ME version earlier today. Here are my initial impressions. Smart Page – The browser’s start page now has two tabs; Speed Dial and Smart Page. Smart Page is a one page summary of your favorite sites, the latest from your Twitter timeline, Facebook news feed and news sites of your choice. Support for more than 9 speed dials – you can have as many as you want, limited only by device resources. Tabs are now closed with a single tap on touch screen devices. When you close a tab, Opera Mini now switches to the last one used rather than the one to the left. The default “www.” prefix has been removed from the address bar. Auto completion still supports it, though. The biggest change is obviously the Smart Page. It has three main sections. At the top are large non-removable icons for the Opera Mobile App Store and Opera’s Facebook page (image above, left). Below is “My Sites”, an ever changing dynamic list of your most visited sites. Next come non-editable icons for Google+, Gmail, Google News and a second Opera Store icon That’s followed by a “Social Networks” section with items from your Twitter and Facebook feeds (image above, right). 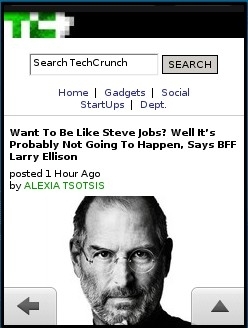 The page wraps up with “My News”, links to recent stories from your most visited news sites and blogs and a nicely organized directory of top sites, which is not customizable (image below, left). The My Sites, Social Networks and My News sections can be independently swiped or scrolled left and right to reveal more items. A like much of the Smart Page but I’m a bit put off by the large number of non-editable links and icons. I realize that many of these are paid placements that help support the considerable development and hosting costs of the browser. It is possible to disable the Smart Page entirely. I hope future releases will give users more control of the Start Page content. The other new features in Opera Mini 7 are all appreciated, especially the ability to have more than 9 Speed Dials. The bug in Opera Mini Next that caused Opera Link to duplicate Speed Dials seems to be banished. At least I didn’t see it on either of the devices I tried Opera Mini 7 on. I briefly used Opera Mini 7 on a basic Motorola WX400 Qwerty clamshell that retails for less than $50 on pay as you go and a Nokia Asha 303, a high end Touch and Type S40 feature phone. Both ran Opera Mini Next with no real issues and Opera Mini 7 worked just as well. As is usual with Opera Betas, Opera Mini Next installed alongside existing any Opera Mini release version. Because Opera Mini 7 is a release version, installing it upgrades your existing Opera Mini 6.5 or earlier browser, retaining all your settings, bookmarks and saved passwords. 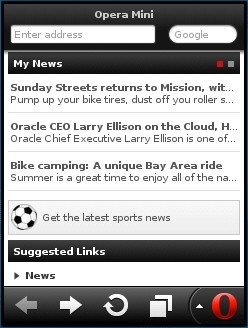 Opera Mini 7 is available now from m.opera.com (mobile) and opera.com/mobile/download/ (desktop). I continue to be impressed by Opera Mini’s ability to quickly, accurately and completely render large, complex desktop web pages even on very basic phones. That combined with the speed, data and money saving virtues of a proxy browser makes it easy to see why Opera Mini is one of the most widely used mobile browsers in the world. It’s particularly popular in the developing world where data is slow and expensive and feature phones are still the norm. 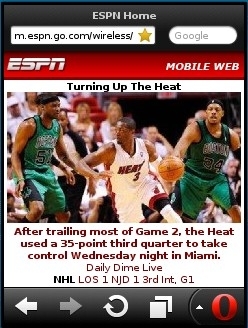 Opera Mini 7 is a major upgrade that adds significant new features and usability to an already outstanding browser. I recommend it. This entry was posted in Browsers and tagged BlackBerry, Java ME, Opera Mini, server based browser, Symbian by Dennis Bournique. Bookmark the permalink. the double zoom is great on my java phone i can pull up detals in photos using the Opera Next HD version. Got a Nokia N8 a month ago. 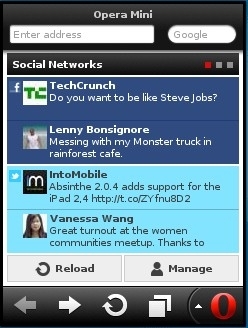 Used a Nokia E61i for 2 years before, and had Opera Mini on it. Installed Mini 7 in the N8, and have a problem with it. I got the option to save username & password on 3 websites, but I have at least 2 sites where I don’t get the option to save. When I log out I always delete all the privacy things so that mini will think that when I log in again it’s the first time. I uninstalled & reinstalled mini but that didn’t work. I did make a bug report & posted about this in the myOpera forum, but no luck yet. Any way to force mini to give me the option? Or, could it some security thing in the sites? Thanks for any ideas. Opera Mini isn’t able to save passwords on all sites. There’s no way to force it to save the password. Note that the Blackberry version has a couple of annoyances, firstly there are now 2 levels of zooms instead of 1 which means more clicks, secondly text wrapping seems to be broken which means a lot of horizontal scrolling on sites that don’t have a mobile version. I had O.M.7 and it didnt work and now i have O.M.Next and its working great. I don’t know why Next would work better than 7 for you, they seem identical on my phones. Use the one that works best, of course. What’s the difference/advantage with “Speed dial” as opposed to normal bookmarks? Speed Dials are large icon buttons on the browser start page that can each be launched by a shortcut key and cam be rearranged by the user into a logical, easy to remember order. I’ll do that when I get some spare time in the next few days. If you’re in a hurry, do it yourself, the instructions are in the post. For the certificate error try a different signed version or an unsigned version. 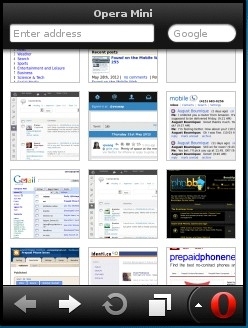 I want to know that does Opera mini on Nokia N8 runs HTML 5?